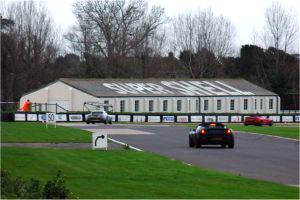 Our opening day of 2019 at Goodwood, one of the last remaining classic racing circuits of the UK – the layout unchanged from it’s heyday in the fifties and sixties. We’re running the day in semi-open pit lane format as we have for many years – rather than put you in set groups you can queue up when you like. For those who haven’t been to Goodwood they basically drop the chequered flag approximately every 15mins so the queue keeps moving. The circuit limit is set at 10 cars while we will book a maximum of 35 cars on the day so things will move quicker than running strict groups. The day includes a meal package for each main driver. The package includes: Exclusive use of the Jackie Stewart Pavilion, including lounge and dining area with decked terraces overlooking the Paddocks and Pit Lane. Tea & Barista Coffee Service throughout the day. Bacon rolls upon arrival & Lunch. (This package is included in the prices below for main driver booking the day. If you have guests it’s possible to buy an extra ticket when booking the day or by letting us know 1 week before the event.) The Aero Café will still be open all day for anyone visiting. NOTE: noise is policed at Goodwood, if you fail the noise limit you will be given one chance to change something for a retest. In 2017 & 2018 over 90% of the drivers who attended Goodwood with us did not have their day ended by noise issues! You must bring a full driving licence which will be checked at sign on. Slick tyres are not permitted. 2nd Driver Choose an optionNo thanksYes please!